Soft corals can be found worldwide in tropical environments at depths of 15 – 95 feet (5 – 30 Meters). This near-surface-depth allows for currents which provide the soft corals with food and oxygen. Soft corals are the dominant element of the reef environment, providing all sorts of shapes and colors ranging from red and yellow to orange and purple. 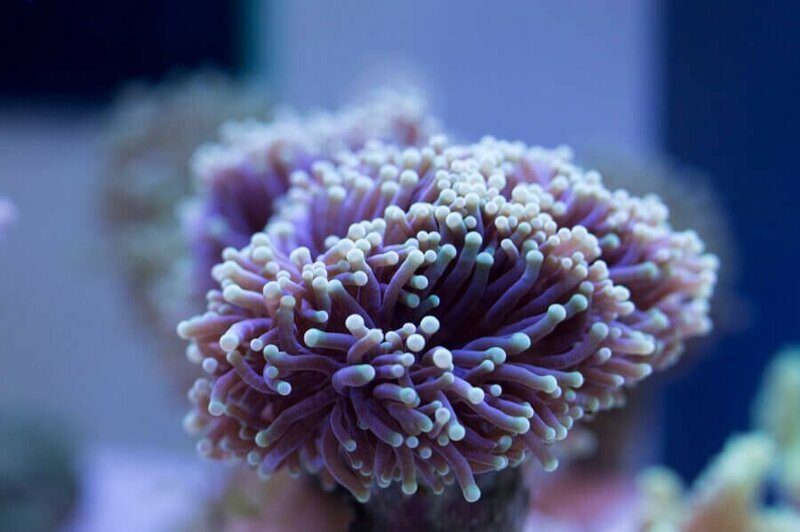 Most soft corals are easy to maintain, fast growing, and good starters for reef aquarium beginners. They can more then double in size and quantity within one year. When creating a habitat for these animals, a strong current should be provided. The current can be created by powerheads which should not be directed at the coral, but rather allow a surrounding flow. Excellent water quality has to be maintained at a specific gravity around 1.025 and a pH of 8.3. Overall filtering requirements are high and should include a protein skimmer. 2-3 Watts of lighting per gallon by VHO or compact fluorescent for 12-14 hours daily. Soft corals can be differentiated from the hard corals by the tentacles. Soft corals do have eight and hard corals multiples of six. With only a few exceptions, soft corals do not have an external skeleton, but numerous tiny spicules in their tissue. Soft corals live in colonies and consist of a basic polyp (hollow cylinder). The polyp is equipped with hair like flagella for the purpose of circulating water throughout the body. This also allows the polyp to re-inflate after it has been withdrawn to the main body. The main body consists of an inner and outer layer held together by a connective layer of collagen fibers. While the inner layer contains digestive cells, the collagen layer provides stability and resistance towards deformation. Living in sometimes extreme currents, the collagen layer is further assisted by the spicules made of calcium carbonate. Soft corals can also contain symbiotic dinoflagellate algae (zooxanthellae) which provide the coral with food in return for a safe environment. Most corals feed on zooplankton in the water. Zooplankton is captured by the tentacles and forwarded to the mouth that directly leads to the stomach for digestion. Corals not containing zooxanthellae algae should occasionally be fed a supplemental micro food for invertebrates. Zooxanthellae containing soft corals appear more brownish in color while the spicules reveal a bright color. Soft corals are territorial and will defend their territory by releasing chemical toxic compounds inhibiting the growth of neighboring animals. Next to the spiky spicules these toxins also protect them from predators such as fish and crustaceans. Snails are probably the main risk; they can bury themselves within the polyp leaving just a tiny hole on the outer skin, eating the coral from the inside out. Soft corals are able to move slowly by extending their base. Clearing the way using their toxins, they leave a white path of destruction behind. Once a coral is in a safe and healthy environment it may not move at all. Living in colonies, the most common form of reproduction is asexual by breaking off a miniature copy of itself; this process is called “budding”. The broken off part will establish a new colony once settled on a hard ground. Other soft corals spawn. Since polyps have both male and female anatomy some release the sperm and others retain the eggs to be fertilized. After hatching, the larvae will be carried away by the current to settle and build a new colony.